Bangladesh Information Minister Hasanul Haq Inu termed the U.S Embassy's rightful statement regarding the beating of students in the peaceful protests as "poking its nose in Bangladesh's internal politics in an indecent way" - that does not sound coming from a minister of a democratically elected government, representing a nation which is also signatory of the Universal Declaration of Human Rights. 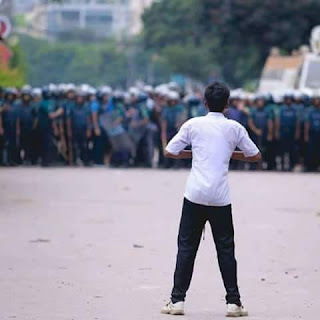 Here is what US Embassy in Dhaka had stated in its Facebook post: "Nothing can justify the brutal attacks and violence over the weekend against the thousands of young people who have been peacefully exercising their democratic rights in supporting a safer Bangladesh"
US Embassy as everyone one else has the right to speak against any brutal attacks and violence on unarmed middle school, high school and university students that did happen mostly from Saturday. Didn't they tell all will be well and good? We live in the age of internet when quick communications through social media is the norm. Some of these news sources look to be true and some of them seem to be dramatized to pursue an ulterior agenda. Seeing various news sources, including some videos and news articles regarding Bangladeshi students protest movement that started last week after at least two high school students had lost their lives when a bus hit them while they were waiting to get on the bus, I am trying to understand actually what is happening in Bangladesh, a country where I lived my nostalgic childhood, where my siblings, parents, grand parents, cousins, uncles, aunts, long gone ancestors and many of my close childhood friends were born. This particular tragic event stirred a movement among the students whose demand is to have safer roads in Bangladesh, where thousands of people die every year from road accidents and many of them are students going to school or returning home from school. Modern nation states need trade. The unprecedented prosperity, stability and peace that exist in majority of world nations, except some heartbreaking war zones, need uninterrupted trade between nations. The recent tariff set by various nations that hurt a wide segment of the business world, and eventually the general populace bear the cost. It's not productive. It does not bring peace in the end. Astrophysics does not need to be filled with the unexplained technical jargon that only specialists or very keen readers can decipher. Neil deGrasse Tyson is one of the finest astrophysicists who, like another prominent astrophysicist before him named Carl Sagan, has mastery in explaining complex astronomical concepts and mysterious cosmic phenomena in a tone and accessible language that most readers can grasp. I am glad I have read his "Astrophysics for People in a Hurry". The title kind of indicates that it's written for a quick review of astrophysics. It's true, but it also gives an illuminating glimpse of our mysterious universe and an urgency, like the word "hurry" to have some sense of our very existence. "Homo Deus: A Brief History of Tomorrow" is a very well written book, a sequel to Yuval Noah Harari's magnificent "Sapiens: A Brief History of Humankind". The writer's accessible way of explaining the technical and societal trend and unmistakable destination where humanity is heading to I found to be exhilarating but sometimes frightening too. It is fearsome to think about a world where humanity as we know of does not exist, but supplanted by unconscious intelligence, far superior than human beings could ever imagined to be. This is the second novel I've read written by Eowyn Ivey. Like her "To the Bright Edge of the World", The Snow Child is a memorable story based in Alaska's snowy wilderness. The pain and anguish of a childless couple in Alaska's cold winter, their yearning for a child in the depth of wintry chill leaps out of the early pages of this empathy filled novel. It has the mystical elements along with its detail description of Alaskan lively nature. At first it seemed it would be a novel filled with magic and fantasy, but it turned out to be celebrating the life's joys and also facing the inevitable griefs. So good the writer's description of Alaskan natural world that I felt I was right there in early 20th century, beside a stoked fireside where chopped woods were crackling in fire.